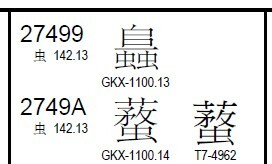 The CJK Unified Ideographs Extension B [13MB] block that was added to Unicode/10646 in 2001 comprises 42,711 characters, and it is no secret that there are many problems with this huge collection of mostly quite rare characters, including hundreds of cases of unifiable characters that have been erroneously encoded separately and even a handful of completely duplicate characters. There is enough material to keep a dedicated CJK-B blogger busy for years to come, but I certainly don't want to go down that particular path. However, a recent psot by Michael Kaplan, How bad does it need to be in order to be not good enough, anyway?, about discrepancies in Han character stroke counts provided by China on the one hand and Taiwan on the other set me investigating one particular character, and its history is convoluted enough to be worth writing up as a case history. 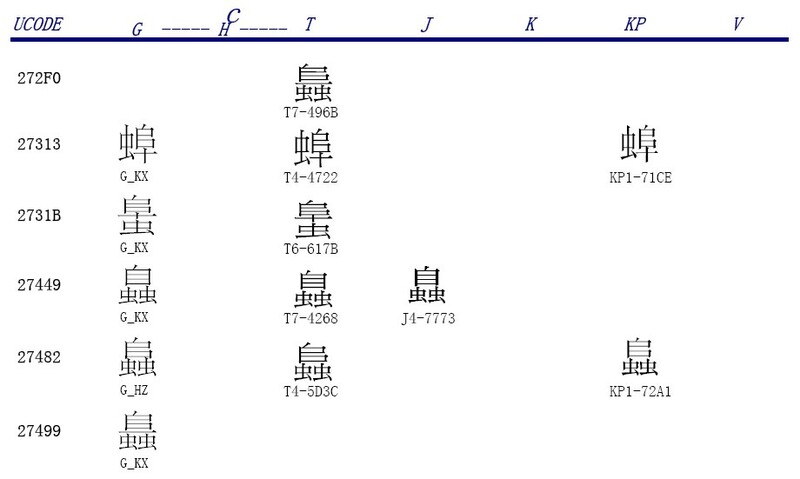 So that would seem to explain where the Taiwan count of "19" came from, but the real question is what this glyph form is doing here, when forms of the same abstract Han character with double radicals are not in Unicode terms unifiable with forms of the same character with a single radical ? Note that although there are only six entries for variant forms of this character, the dictionary does actually use seven variant forms, as the fourth entry above is defined as a corruption of a variant form that does not itself have an entry (⿱¤⿰虫虫)—despite the fact that that form is also referred to in the sixth entry. Hmm, everything seems in order, except for the Taiwan source glyph for U+272F0 which does indeed look as if it should be the source glyph for U+27499, but if that is the case what is the correct source glyph for U+272F0 ? What this is saying is that T7-496B had been proposed for unification with the character that would eventually become U+27499 璙, but as the characters are not unifiable T7-496B should be added as a separate character (and in case anyone is wondering what IRG N699 has to say about the character, so do I, but unfortunately this document does not seem to be listed in the IRG document registry). 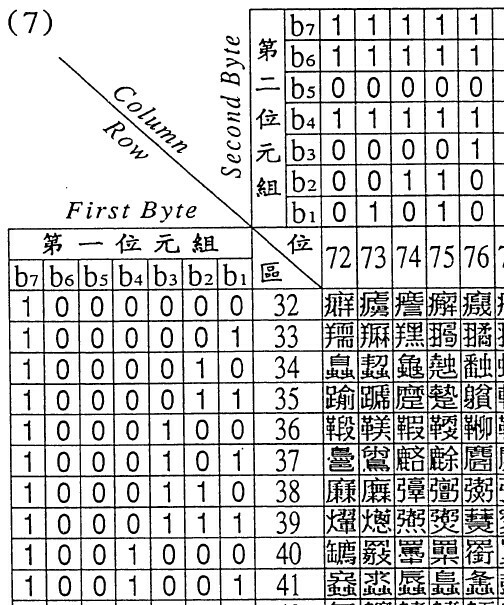 So on the basis of this document (IRG N738) T7-496B was added to the FDIS repertoire at U+272F0, and that's how it managed to sneak into CJK-B at the very last minute. 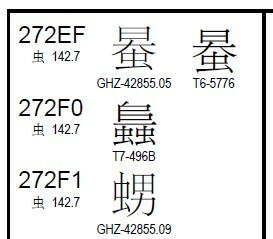 Unfortunately, presumably because T7-496B was originally intended to be unified with U+27499, Taiwan somehow got the glyph for T7-496B wrong in their reference font, with the result that the Taiwan stroke count for U+272F0 is out by six, and the Taiwan source glyph for U+272F0 in the new draft multi-column charts (IRG N1381) is the same as the PRC source glyph for U+27499 (incidentally the correct source glyph for U+272F0 is shown is Super CJK Version 10.2 [32MB] page 675 and Super CJK Version 14.0 [64MB] page 1473). I guess that once the Taiwan source glyph is corrected and the Taiwan stroke count data is amended it should be the end of the story, but the one thing that nags at me (as is the case with so many characters which only have a single Taiwan source reference) is what is the ultimate source of this character and which texts is it used in ? So if anyone can show me an example of U+272F0 in running text (before it was actually encoded) please let me know. What Eric noticed was that characters to the left of it and the characters to the right of it all have 13 residual strokes, which strongly suggests that T7-496B should also have 13 residual strokes, and not 7 seven residual strokes as shown here. That is to say, it is looking more and more likely that T7-496B should in fact be the Taiwan source reference for U+27499 璙, and that U+272F0 狰 is a phantom character. But it is probably too late to do anything about it now—if Taiwan were to change the source glyph and request a source reference correction for T7-496B (remapping to U+27499) that would leave U+272F0 an orphan, which is not a happy ending. This pretty much clinches the argument I think. I'm not sure that this is a better solution, and I still think that the T7-496B source reference should be moved to U+27499.